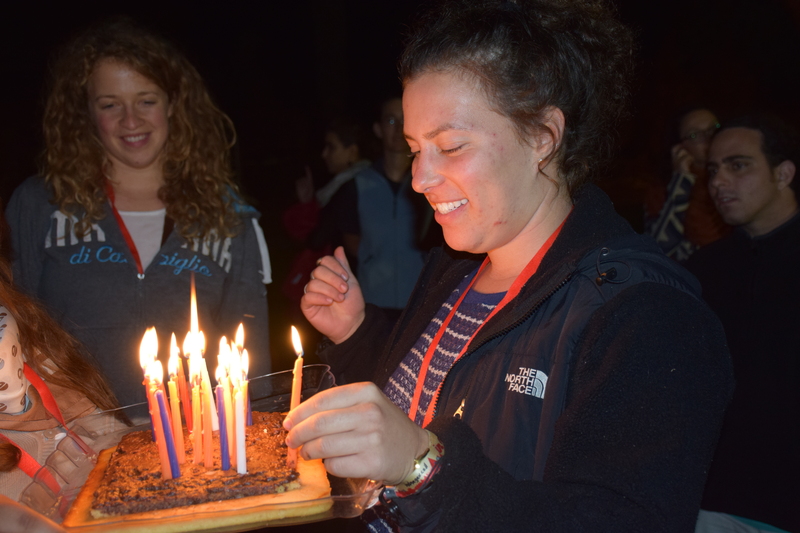 Alrighty, as promised here are pictures from the second half of the anniversary celebration of Ketura’s 41st year as a Kibbutz. In addition to the skits and speeches made last time I posted, there was also a special wake for the dairy center on the kibbutz. It was done in the style of an irish wake, so irish music was playing and the center was open for everyone to tour and look around. There was a slideshow with pictures of the cows from the last forty one years and they served milk and ice cream to everyone at the wake. I wandered around with my camera for a bit, it’s hard to fully appreciate these things when everyone is speaking a different language. 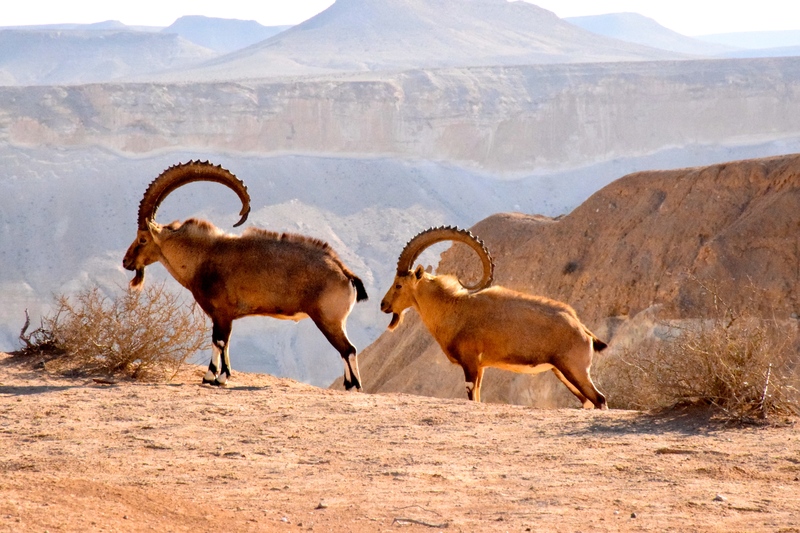 The day after the wake for the dairy farm, I headed to Eilat with some friends to run a few errands and get off the kibbutz for a bit. The picture of the acacia trees below is one I’ve been trying to remember to take for awhile. There’s a twenty second stretch of the bus ride from the kibbutz to Eilat where there’s a good angle to take a picture of these trees so I can tell you all about them but I usually don’t have my camera, or I’m asleep, or I forget, etc. etc. But this week I remembered! 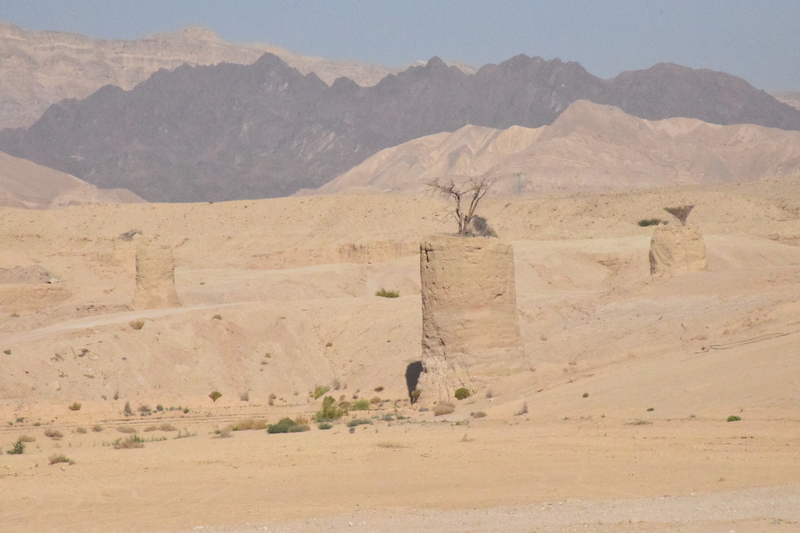 So, as you can see, the acacia trees in this picture are not only dead, but planted on little pedestals in the middle of this wadi (riverbed). I asked my ecology professor about this on one of our field trips because this obviously isn’t a natural phenomenon and he explained that this was the result of an experiment in the past. They’d had to dig up the wadi to build the road but they wanted to preserve the acacia trees. Making the assumption that the roots of an acacia tree grow straight down, they created the pedestals so the acacias wouldn’t die. Unfortunately, the roots of acacia trees grow horizontally and all of the acacias died. So that’s the story of the acacia trees! Once we got to Eilat we had a blast. We dropped by the mall to drop off a watch to be fixed and buy some sandals. 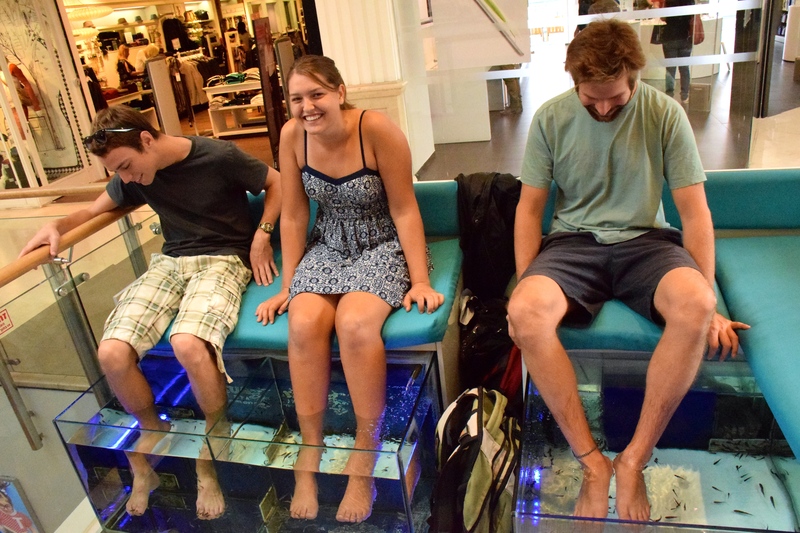 We also ended up doing the fish spa, which is what the picture below is. This was something my friend and I found a few weeks ago but we didn’t have enough time to do it then (we had to catch our bus back to the kibbutz). But this week we had plenty of time, so we stopped by and got our feet cleaned by fish, and because no one was around the woman let us stay for as long as we wanted. Essentially how it works is they have fish tanks full of a type of fish that eats dead skin and other materials like it. When you put your feet in they chow down and you get all the dead skin removed from your feet (or at least most of it). And because you’ve got 20+ fish nibbling on your feet it’s incredibly ticklish and once you get used to it, it stops being ticklish and just feels like an electric current is being run over your skin. After shabbat dinner in the evening we headed over to a kibbutz to the South of us for an “Ethiopian Festival” which ended up just being a concert, I’m not even sure it was Ethiopian. But it was good music and we had a good time dancing and looking around the other kibbutz. I found a dog that I thought was absolutely adorable, but I’m sure others wouldn’t think he was quite as charming. 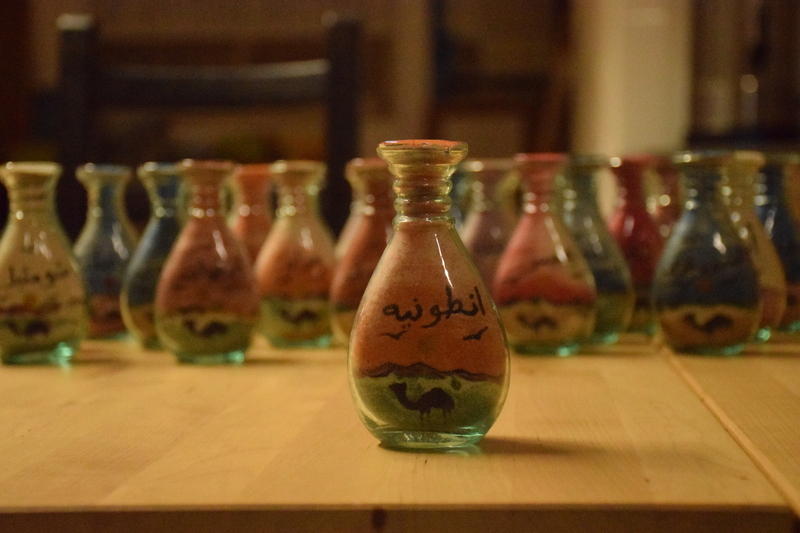 One of the other students was home in Jordan and brought back little jars with sand pictures in them that he’d had his friend made for all of us (in one night!). Each jar had our names written in Arabic on them. It was an awesome gift! 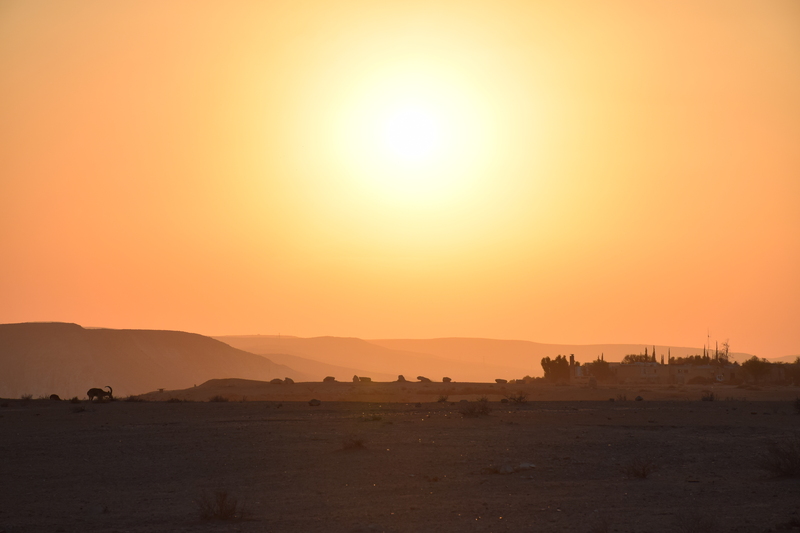 So the last couple of days we went to the Drylands, Desert and Desertification Conference at Sde Boker, which is about an hour and a half North of us. It’s a very small town with an offshoot of Ben Gurion University located there. 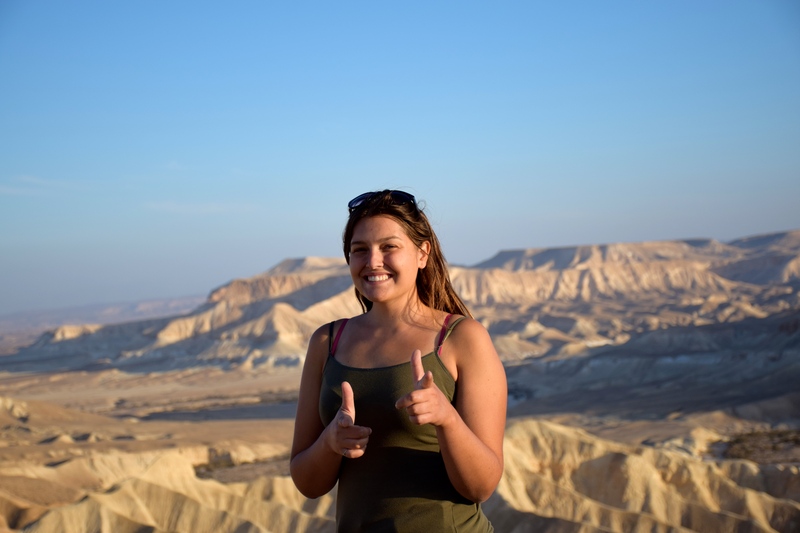 Quite a few Arava students end up going there for their Masters or PhD degrees for a variety of reasons, so we stayed with Alumni since it was a two day conference. 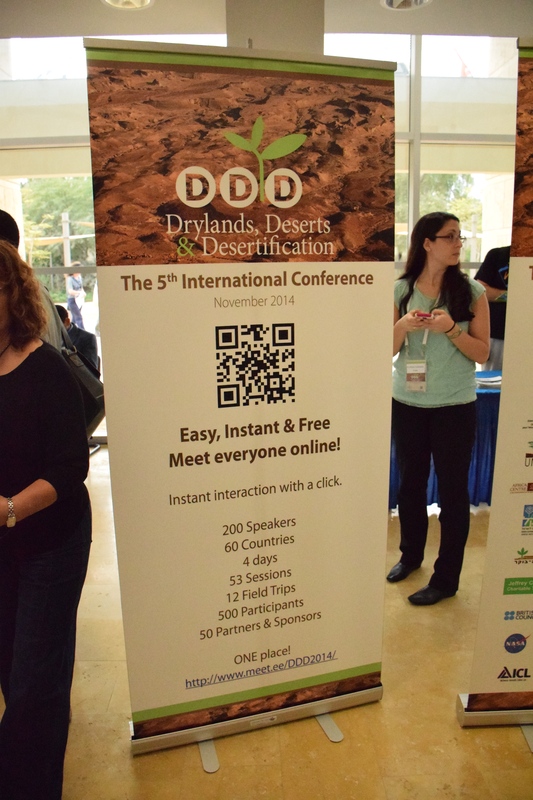 Most of the conference consisted of parallel sessions with researchers and PhD students and professors presenting their work in the driest way possible. The presentation below was about a project to build a greenhouse in Mexico. The guy who was presenting couldn’t get hang of using the laser pointer (he kept switching to different slides instead) so the staff found him a big stick to use as a pointer. But the coolest part of this presentation was when they switched speakers halfway through. The second speaker did her half of the presentation (about the actual building of the project) in Spanish! Yaaaayyy! They had a guy translate, but he wasn’t translating word for word so anyone in the audience who didn’t speak Spanish missed a lot of the jokes she made. She was one of the few fun presenters. 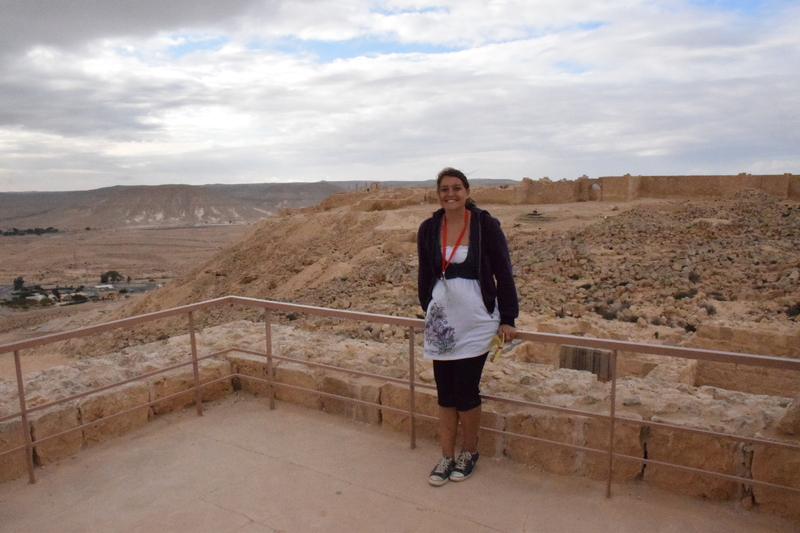 At lunchtime the conference offered five different tours for people to go on to see the local sites and learn about different things in the Negev (bedouins cultures, rock art, Ben Gurion’s tomb, the Avedat ruins, or a nature hike). I was feeling up for the challenge so I headed to the Avedat ruins that overlook a little pit stop that we’ve stopped at a few times. 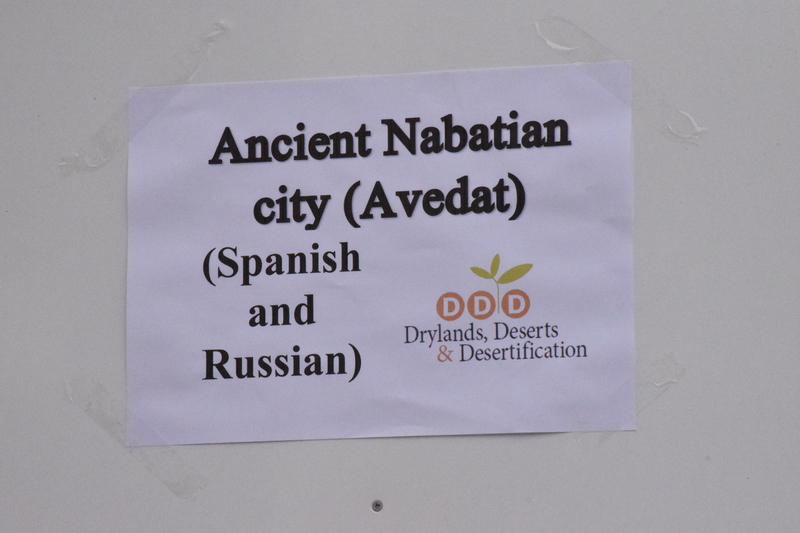 It was a challenge because the tours were only offered in Spanish and Russian. So I went with the Spanish group, made some new friends and totally understood everything! It was awesome! 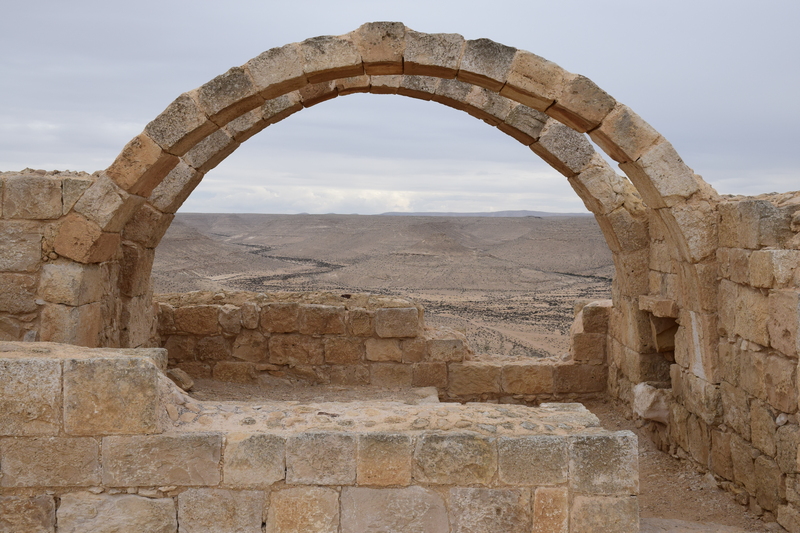 Below is one of the arches in the ruins. We didn’t have time to go look at the rest of the city (boo) but you can see it in the background behind me. It was freezing cold and windy so I borrowed a jacket from one of the other students before we left on the tours. It was one of the student’s birthday on the trip, she made herself a cake so we sang to her and wished her a Happy Birthday. The second day I went on a hike after lunch to see the view from Sde Boker (down below is Wadi Hawarim, which I’ve nicknamed Friend Wadi, I think I’ve mentioned it before?). 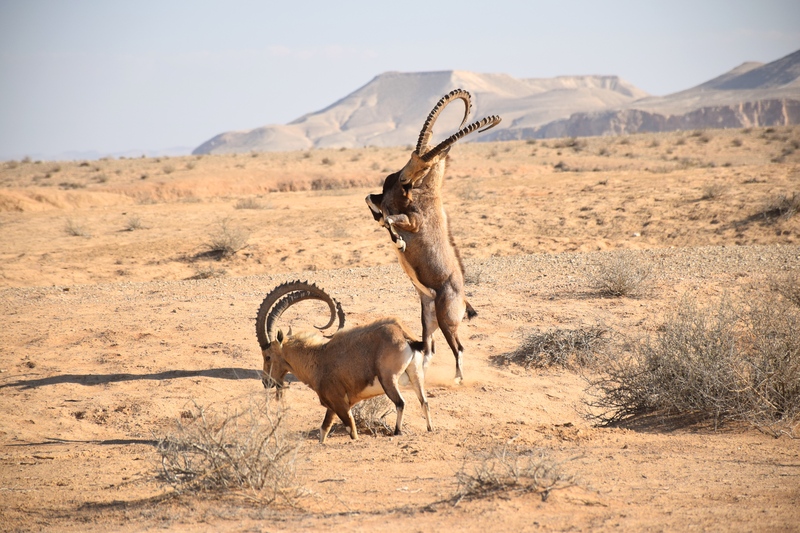 I ended up hanging out with a herd of ibex, luckily I had my camera on me. At one point they were all crossing the path so I just sat down and took pictures as they passed within five feet of me. They’re quite darling animals. I figured it’s been awhile since I last put up a picture of me, so, since I had extra time. I set up my camera and did a nice photo shoot of myself with Friend Wadi in the background (yeah I took that picture, look ma, no hands!). A nice sunset over Sde Boker. 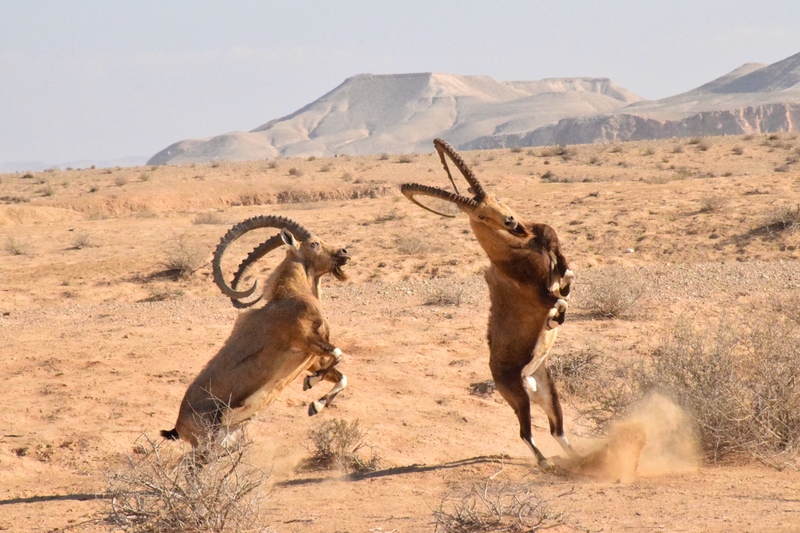 Ibex on one side, Sde Boker on the other. #datkibbutzlyfe: So apparently the stereotypical view of a kibbutz in Israel includes a little socialist community where everything is shared, with some sort of dairy farm, or some other pastoral animal (mostly cows). 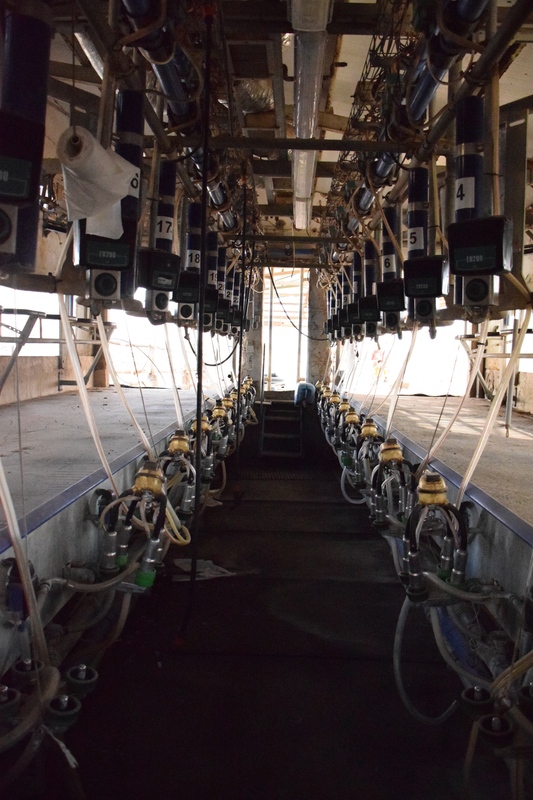 Because of this, the decision to close the dairy center and invest in the algae plant was a rather controversial one on the kibbutz, hence the wake. It was pretty interesting watching all of the children running around the dairy center, knowing that in ten years they won’t remember this at all. The kibbutz was found in 1973, shortly after it was founded the founding members got into some sort of argument and left. So I’ve met one or two founders but the majority of the older crowd here arrived at the kibbutz a couple of years after it was founded. This kibbutz was created by an international community and is one of the few kibbutzim that allows for both secular and religious people to live there. The two communities manage to live in harmony together, a real feat here in Israel but perhaps not nearly as impressive to me, coming from the US. Interestingly, as one of the other students pointed out at Shabbat dinner last week, when the two communities try to live together supposedly it’s a compromise between them. Here, however, it’s not as much a compromise with a religious community as a large number of secular people who adjust their lifestyles to fit with the religious folk. This does occasionally become a little inconvenient for the secular folk.